Process everything in a mixer of blender. In a hot pan, melt Wagyu fat and cook steak to your liking. Allow to rest. If you would prefer to use the barbeque, coat Wagyu in duck fat and cook on a high heat to your liking – we suggest medium rare. 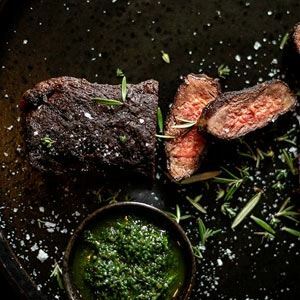 Place chimichurri in a bowl, cut steak and place on a plate. Top with salt flakes and fresh rosemary.